North Country Real Estate is located in Fulton County just South of the Adirondack Park and the Great Sacandaga Lake. Fulton County is an area that abounds with activities for its residents. There are few places in the world that offer such a great diversity of attributes as the Southern Adirondack region of upstate New York. Let's start with the vast Adirondack Park with its numerous lakes and recreational areas. This area's natural resources are astounding. There are trails for hiking and mountains to climb, areas for biking and snowmobiling and almost unlimited opportunities for sportsmen. The variety and mixture of trees provide fall foliage colors that few areas can even come close to. One of the greatest traits of this resort-like environment is that you can live here and make it your home. Our proximity to so many attractions is what makes living here so special. You can find almost anything within a short drive of your Lake front home. The capital in Albany and the cultural center of Saratoga Springs are within an hours drive. The diversity of businesses that call the capital district home provide employment in virtually any field. Clean air, low crime and abundant educational opportunities make this region one of few equals. The Adirondack Park is one of the United States' largest national parks at 6.1 million acres or roughly the size of Vermont. The Adirondack Park is the size of Yellowstone, Everglades National Park, Glacier National Park, and the Grand Canyon National Parks combined. What sets the Adirondack Park apart form other National Parks is that much of it is privately owned. Fulton County is the "Gateway" by which most enter the Adirondack Park via the NYS Thruway. Fulton County has 44 lakes, making it a paradise for boating and fishing. The area features numerous public trails throughout the Adirondacks for hiking, mountain biking and skiing. The area also offers abundant hunting areas for the sportsman. Once in Fulton County, you have the choice of continuing North on Rt 30 or heading West on Rt 29. Most of the areas large lakes are accessed by these two main roads. As you travel along either you pass lakes on the roadside every 10-20 minutes. Recognizing there was no one point to find information of the various lakes in the area, we assembled this page. Please remember even the Department of Enviornmental Conservation (DEC) has only limited information on many of these areas. While far from complete, the information on this page was assembled from various sources from the NYS DEC to local common knowledge. Peck Lake is a man made reservoir covering 1370 acres. This is a protected lake with boating limitations, securing a serene peaceful setting. The Peck Lake Protective Association has a stocking program and the lake supports Large and Small Mouth Bass, Chain Pickerel, Brown Bullhead, Yellow Perch, Pike, and Rainbow Trout. The Great Sacandaga is a man made reservoir constructed to control downstream water levels of the Huson River. The Great Sacandaga Lake is 29 miles long and has nearly 125 miles of coastline. It covers 24,707 acres with a mean depth of 40 feet. The lake reaches a depth of 90 feet in the fork near the Conklingville dam. The Sacandaga is home to year-round recreational activities and features restaurants and shopping in the surrounding area. The Sacandaga has room for large boats and hosts many fishing tournaments. 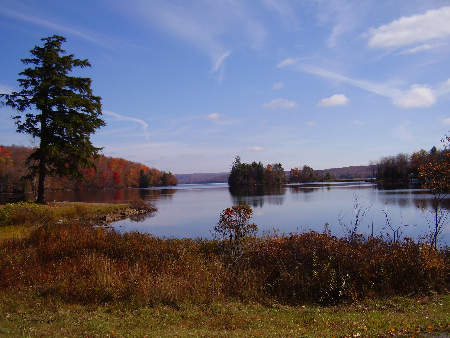 The lake supports Large and Small Mouth Bass, Chain Pickerel, Brown Bullhead, Yellow Perch, Rainbow and Brown Trout, Tiger Musky and Land-locked Salmon. The Sacandaga is stocked with Walleye yearly and holds the longtime record for a 46 pound Northern Pike. East Caroga Lake covers 198 acres with a mean depth of 13 feet. West Caroga Lake covers 275 acres with a mean depth of 34 feet. The Caroga Lakes are a popular winter sports area. Caroga Lake has increased snowfall making it a favorite for snowmobilers. The comunity of Caroga Lake features small shops and restaurants and many seasonal residences. Fishing and boating are popular activites in this area whose population quadrupples in the summer. The Caroga Lakes support Splake, Large and Small Mouth Bass, Rock Bass, Chain Pickerel, Brown and Yellow Bullhead, Whitefish and Yellow Perch. This group of lakes includes West, Green, and Canada which are connected to several others. Canada Lake covers 554 acres and has a mean depth of 70 feet. Canada Lake is located in steep terrain offering a deep lake surrounded by spectacular mountain views. Canada Lake offers great water skiing and excellent kayak/canoe opportunities. These lakes have small streams which make for peaceful paddling with terriffic views. These lakes support Chain Pickerel, Brown Trout, Brown and Yellow Bullhead, Pumpkinseed, and Yellow Perch. East (77 acres)and West Stoner Lakes offer boating and fishing in quiet, smaller packages. Stoner Lake has a fish stocking program and the lakes support Large and Small Mouth Bass, Rock Bass, Brown and Yellow Bullhead, and Yellow Perch. This is also one of the nicest areas for canoes/kayaks, there are several connected lakes nearby, which can give 8-10 mile trips. Properties along these lakes are rare in that they border state owned land. Many of these properties are waterfront with thousands of acres of NYS wilderness behind them. Walk out your back door and it may be as far as twenty miles before another road crosses your path. Pleasant Lake covers 248 acres and has a mean depth of 23 feet. Pleasant Lake is in a relatively undeveloped area which is a favorite for sportsman and snowmobilers alike. The lake supports Chain Pickerel, Large and Small Mouth Bass, Rock Bass, Brown and Yellow Bullhead, Pumpkinseed, and Yellow Perch.